Standing at around 3 feet high the granite boulder known as the Turoe stone is a beautifully decorated phallic stone, the top half is covered with a curvilinear design typical of the Celtic art style known as La Tene, this dates the stone to around the 1st to 3rd centuries BCE, the middle is decorated with a form of Greek key. The patterns are carved in relief using a technique known as poking. 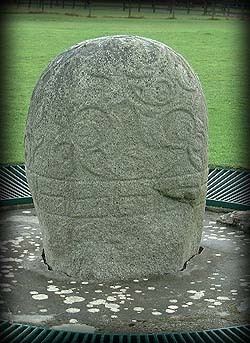 The Turoe stone is one of the finest examples of these ritual stones in Europe, there is another ritual stone at Castlestrange, Co Roscommon also decorated with a curvilinear design, but this stone is incised rather than carved in relief. 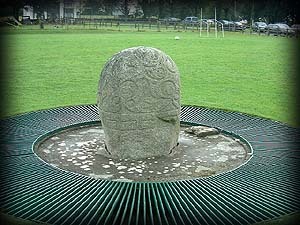 Although known as the Turoe stone this is not the original location, the stone was removed from an Iron Age ring fort, the Rath of Feerwore a few miles away. Latest update 31st Jan 2014: The Turoe Stone, Co. Galway is currently not accessible to visitors. The highly decorated stone has been removed to the Office of Public Works depot in Athenry for urgent cleaning / conservation. Discovery Map 52: M 2636 2255. Last visit Aug 2014.